Please welcome today's paranormal guest author Ruth Frances Long. Ruth is the author of The Treachery of Beautiful Things . Keep reading for a chance to win a The Treachery of Beautiful Things bookmark and postcard. Ruth: I've been writing as long as I can remember, and probably making up stories before that. Certainly by the time I was a teenager I was writing novels, because I remember getting caught in German class writing in a copybook under the table. Still don't know any German. Ruth: I've always loved paranormal and fantasy stories. I started out on the Hobbit and Greek legends. And of course Ireland, where I live, is rife with myths and legends. All part of the psyche, perhaps? Ruth: Flying. I was going to pick teleportation, not because I'm lazy but because I could avoid going out in the rain. But then I figured if I could fly I could go above the rain clouds and it would generally be a lot more fun. I would have to get over my fear of heights though. But if I could fly, I wouldn't need to worry about falling. So win win. Ruth: The Treachery of Beautiful Things is dark and mysterious, ful of beautiful creatures you can't really trust, much like the Realm of the Fae and the Fae themselves. It's action packed, full of adventure and a dash of romance with a fae boy, with torturous secrets of his own. Jenny is a heroine who learns to save herself and others, and that true strength lies within. Ruth: This is SUCH a difficult question. The characters are so real to me in their own right that I can't really imagine someone else playing them. That said... I'll try. Jenny - Need to be strong, but vulnerable. Someone like Saoirse Ronan or Emma Watson. Jack - One of my friends on Twitter told me she pictured Jeremy Sumpter, which I can totally see. I also imagined Andrew Lee Potts as Hatter in Alice, or Brad Kavanagh from House of Anubis. 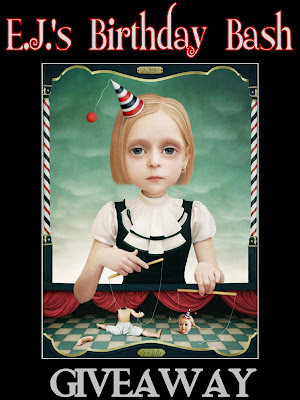 It think its mostly about the pathos with this character. I'd love to see him come to life. Oberon - Intensity is the key here, someone like Gerard Butler? Titania - Michelle Pfeiffer. I love Michelle Pfeiffer. I'd love to know what readers think and who they would pick. My ideas are totally subjective. Thank you Ruth for joining us here today at From the Shadows! 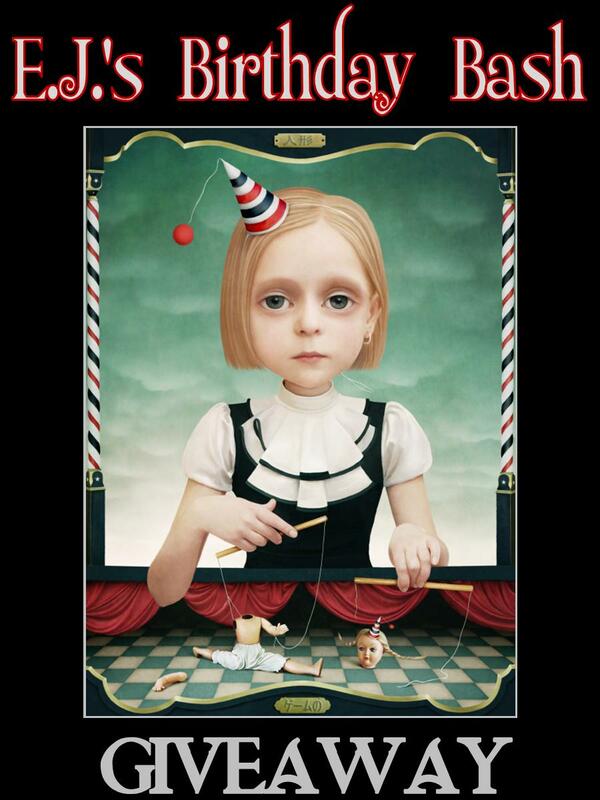 To learn more about Ruth Long and her books, please visit her website. 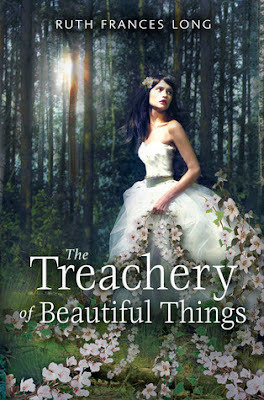 We are giving away a The Treachery of Beautiful Things bookmark and postcard to one lucky winner. To enter, please leave a comment on this post and include your email address so we may contact you if you win. This giveaway is to US mailing addresses only. Giveaway ends September 13, 2012 midnight EST. We are giving away ebook copies of She Smells the Dead , Spirit Storm , Legend of Witchtrot Road , the first three books in the Spirit Guide young adult paranormal series, and Shadow Sight, the first novel in the Ivy Granger urban fantasy series. To enter, please leave a comment on this post and include your email address so we may contact you if you win. This giveaway is INTERNATIONAL. Giveaway ends September 6, 2012 midnight EST. Congratulations Toby Sparrow winner of our Just For Fins Giveaway at From the Shadows! Toby will receive a copy of Just for Fins by Tera Lynn Childs. Congratulations Donnas, Kristina, Steph, Holly, Tasnim, and Antoinette winners of our Shadow Sight Release Party Giveaway at From the Shadows! Donnas will receive the Grand Prize: Signed copy of Shadow Sight by E.J. Stevens, Ebook copy of Shadow Sight by E.J. Stevens (choice of mobi or pdf), Shadow Sight t-shirt (Size XL, Private Eye logo on front, left chest and full color book cover on back), Private Eye sticker, Private Eye pen, Ivy Granger magnet, signed Shadow Sight postcard. 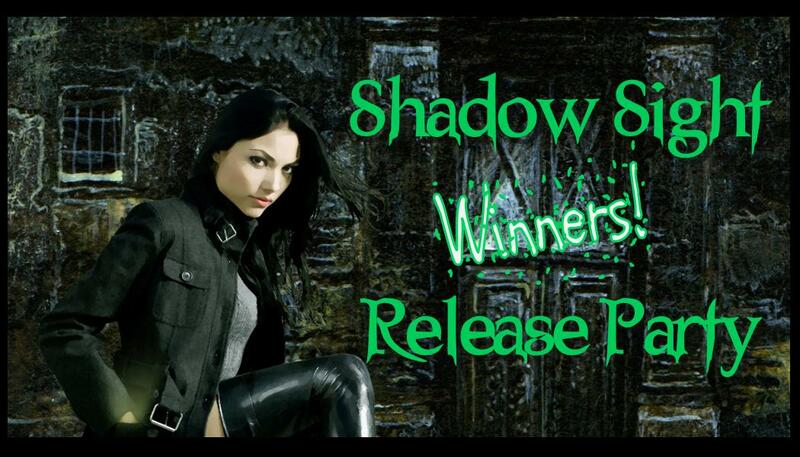 Kristina will receive First Prize: Signed copy of Shadow Sight by E.J. Stevens, Ebook copy of Shadow Sight by E.J. Stevens (choice of mobi or pdf), Private Eye sticker, Private Eye pen, Ivy Granger magnet, signed Shadow Sight postcard. Steph will receive Second Prize: $10 Amazon Gift Card (or book up to $10 value at The Book Depository) Ebook copy of Shadow Sight by E.J. Stevens (choice of mobi or pdf), Private Eye sticker, Ivy Granger magnet, signed Shadow Sight postcard. Holly, Tasnim, and Antoinette will receive Third Prize: Ebook copy of Shadow Sight by E.J. Stevens (choice of mobi or pdf), Private Eye sticker, signed Shadow Sight postcard. Thank you all for partying with us and making the release of Shadow Sight a huge success! For more information about Shadow Sight, and a listing of current giveaways, please visit the official Ivy Granger series website. Please welcome today's paranormal guest author Tera Lynn Childs. Tera is the author of the Oh. My. Gods. series (Oh. My. Gods. , Goddess Boot Camp ), the Medusa Girls series (Sweet Venom , Sweet Shadows ), and the Fins series (Forgive My Fins , Fins Are Forever , and Just for Fins ). Keep reading for a chance to win a copy of Just For Fins by Tera Lynn Childs. Tera: It was a total accident. I had been writing historical romance and contemporary chick lit when I started playing around with reality TV show titles. At the time, a show called Growing Up Gotti was on A&E and I tweaked the title to be Growing Up Godly (the working title for Oh. My. Gods.). Since I don't write inspirational fiction, I knew the Godly bit had to refer to something else. I'd always loved Greek mythology, so that immediately sprang to mind. Tera: I would be a mermaid. I've always wanted to be a mermaid. I've always loved the water and was a competitive swimmer growing up, so I would love to be able to spend even more time swimming. Plus, my hair always looks great underwater. Tera: Just For Fins is the third book in the series that started with Forgive My Fins and Fins Are Forever. In this book, readers will get to see far more of the mermaid world as Lily starts taking her princess duties very seriously. There are kings and queens from other mer kingdoms and Lily travels throughout the Western Atlantic on her mission to save the oceans. Tera: Oh, I'm always so bad at this. I make character collages when I start a book, and that's the image that get branded in my mind for the characters. They're always wildly inappropriate. In my collages, Lily is played by Shakira (with her crazy frizzy blond hair) and Quince by Eric Dane (based in a picture of him straddling a motorcycle). 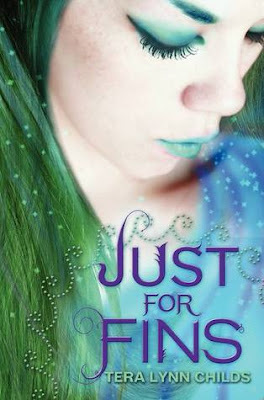 Just For Fins (Fins #3) by Tera Lynn Childs. When Lily Sanderson decided to remain Crown Princess Waterlily of the mermaid kingdom Thalassinia, she knew she couldn’t just coast along in the current. But since she’s spent the last couple of years on land—with gorgeous human Quince by her side—Lily’s not sure she has the fins to lead a kingdom. Even her maddeningly pretentious cousin Dosinia seems to know more about ruling than she does. Thank you Tera for joining us here today at From the Shadows! To learn more about Tera Lynn Childs and her books, please visit her website. We are giving away a copy of Just For Fins by Tera Lynn Childs to one lucky winner. To enter, please leave a comment on this post and include your email address so we may contact you if you win. This giveaway is to US mailing addresses only. Giveaway ends August 16, 2012 midnight EST.